Tens of thousands of people gathered at the Kotel to pray for G-d's help in destroying Hamas. Tens of thousands of people gathered at the Kotel (Western Wall) Sunday to pray for the welfare of IDF soldiers locked in battle with Hamas terrorists in Gaza. The prayers were held in the context of “Yom Kippur Katan,” a “minor Yom Kippur,” which takes place on the eve of a new Jewish month, and which many dedicate to prayer, repentance, and fasting. On Sunday night, the Jewish month of Av begins. The first nine days of the month, leading up to the Fast of the Ninth of Av, are days of semi-mourning for the destruction of the Holy Temple, with many Jews refraining from eating meat, taking haircuts, or dressing in freshly-laundered clothing. Among the worshippers was Rabbi Shmuel Rabinowitz, Rabbi of the Kotel and Holy Places, and the Pinsk-Karlin Rebbe, leader of a Hassidic group. Also attending were government officials, including Beitar Ilit Mayor Yaakov Guterman, and Jerusalem Deputy Mayors Yosef Deutsch and Yisrael Kalderman, among others. The Kotel has in recent weeks become a magnet for Jews from around the world, who have gathered to beseech Heaven for assistance in the war against Hamas terrorists, and to ask G-d for help in defeating the enemy. 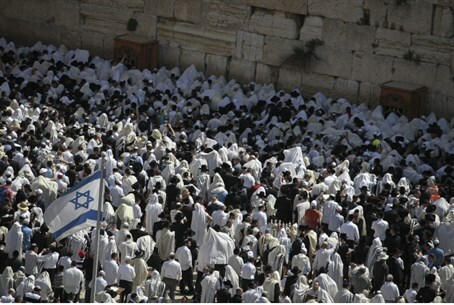 Large crowds have been gathering at the Kotel daily, despite the security risks. Police have stationed hundreds of police in the Old City of Jerusalem and along the paths leading to the Kotel.